During a quick four day break in Bangkok, I honestly thought our days would be filled with shopping and trying as many eateries in the city that we could squeeze in. We are both Thai food fanatics and love the local street stalls. When our friend Lulu told us she’d heard about a really cool bicycle ride through Bangkok, I choked on my Pad Thai … why would she, Miss No Exercise, want to get on a bike in the middle of one of the most populated cities in the world with its crazy traffic? However, we were keen to explore this fabulous city from a different perspective, and especially keen to see Lulu on a bike, so we agreed to the adventure. Even with Thai written instructions we struggled to find the location, but soon reached a small cul-de-sac where there were bikes galore. A friendly guy, Khun Nit, met us at the taxi, delighted that we were joining the morning tour. Our group of three ended up being the entire squad as others didn’t arrive on time. Khun Nit took us firstly through a local suburb of the back of Bangkok and then the slums where we stopped at a local orphanage. The smiles of the people we met along the way was a truly Thai experience. The generosity of being offered a slice of mango as we biked through some of the poorest areas tore at our hearts. We soon left the skyline of buildings behind us and headed for the river. The Chao Praya River isn’t known for its purity and I hate boats, but the opposite bank lured. Crossing seemed impossible as a multitude of boats raced to and fro with little consideration for the usual rules. My fear of boats had to be bagged and sealed for a mere ten minutes as we stored our bikes and boarded a tiny river shuttle … the water level was only about 1cm away from lapping over the edge of the boat once we were all onboard, but the speed with which our driver shot across the water kept us buoyant and we literally flew to the other side. Safely ashore, we headed into the jungle. Who would have thought … a few minutes from the city centre and we’d found ourselves in an oasis of amazing palm trees and lush green areas. 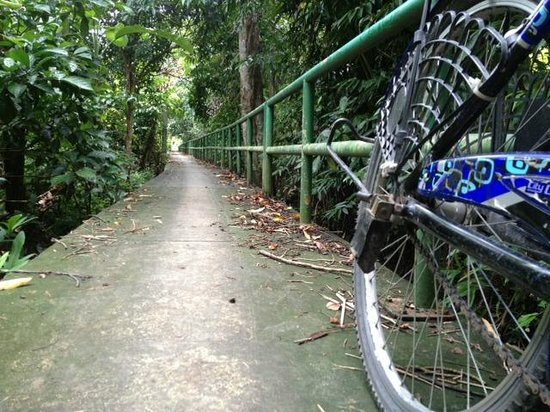 We biked along very small and narrow walkways, raised up on stilts approximately 3m above swamps, and passed by many small villages where I was able to satisfy my desire to try every small eatery and taste the many flavours of Thai food. Khun Nit then took us to a very traditional Buddhist temple where we met with some monks. By chance, we’d arrived at the time of a large ceremony and were able to make wishes and say prayers in the traditional way with the monks. We then left the temple area, crossing again through the jungle before boarding a ferry. Thankfully, this vessel was larger than the first one, so I was able to relax a little. Well, I didn’t need to hold on to the rail so tightly, and was even able to take photos as we approached the city once again. Bikes back on track, our last hour of cycling was through a couple of Bangkok’s more “modern” suburbs with their many markets and local shops, always so alive, colourful and full of ever-smiling people. As a regular visitor to Bangkok for both business and leisure, this bike tour will remain in my memory as one of my best ever Thai experiences. It showed me a city I didn’t know existed and gave me a deep desire to do more of the same on the next trip. Even our Miss No Exercise is keen to explore more of Bangkok on bikes – we are so looking forward to the next trip! Colours of Bangkok Tour: allow 4.5 hours.The tours follow routes that are 95% traffic free, so you avoid the mesh of taxis, Tuk Tuks and other heavy vehicles. Rest stops are provided, as is water and a local meal. The excursions run daily at 8am and 1pm and there’s a maximum of 8 per group. Cost: approx NZ$42 per person.